This Funky 70’s round, lugless circular case design circa 1970’s is powered by a Valjoux 7737 manual winding, 17 Jewel movement with 10 minute countdown function. Bold blue dial with bright yellow and red 10 minute count down track and red chrono sweep hand. Case is approximately 43mm (excluding the crown). Includes original blue synthetic strap and original box. Memosail produced a few variations, but this is definitely the most striking model with a strong 70's vibe. Case is in good overall condition, showing minor scratch near 8 o'clock and a small ding near the crown. Original dial and hands are pristine. Acrylic crystal has some superficial signs of wear but is tight and spot-free. Weathering apparent on case back near both lugs. 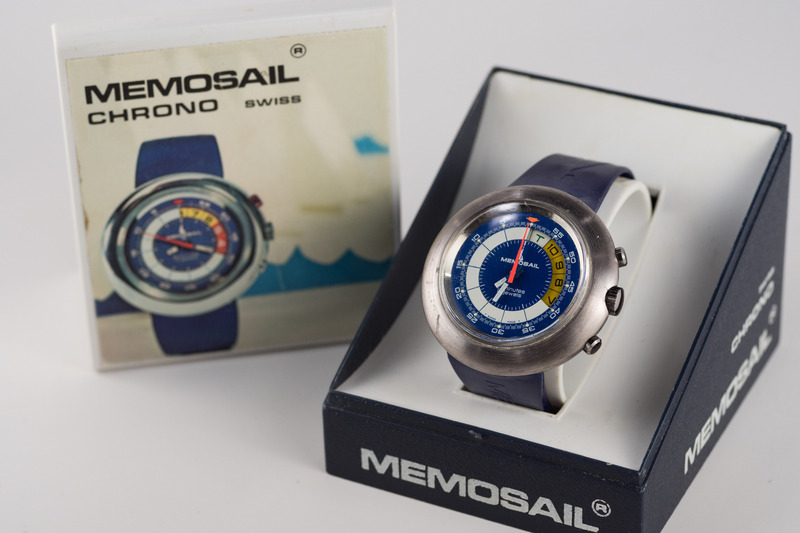 Includes rare original blue Memosail synthetic strap and Original Box. $1050 includes insured shipping in the US. World wide shipping available at actual cost. Feedback is available upon request. Additional images available via PM.